Some of the finest homes ever built are being built right here by our custom home builders. Insulated Concrete Forms offer benefits unmatched by older materials, and few are as experienced at constructing them as our team. The structure of the concrete allows for a complete range of benefits that stick-built homes can’t hope to match. Yet, depending on the variable cost of concrete, ICFs can actually be cheaper to build than those same home built from wood. ICFs are so naturally insulating that the temperature is typically stable throughout the entire structure. You’ll notice no hot or cold spots as you move from room to room, and it can take hours for an ICF home to lose heating and cooling. Traditional homes are vulnerable to a massive range of threats. ICFs hold their own—against high wind, water, insects and much more. You can be sure that an ICF home will be around for years to come. Concrete can be shaped in a variety of exciting ways. Our experienced custom home builders have the talent to use this material to bring your most interesting designs to life. Tell us about your custom plans today. Efficiency isn’t just about comfort, it’s about value. ICFs owners typically pay only a fraction of the heating and cooling costs paid by owners of stick-built homes. Care to see proof? Here, you’ll find numbers from one of our most recently-built ICF homes that is 3,364 square feet. You’ll note that these amazing savings come with our personal guarantee. The average 3000 sq. 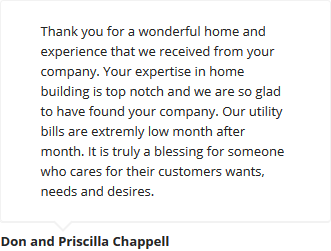 ft. home has a monthly energy bill of $300 per month. An ICF home of around the same size, however, costs only an average of $90 per month. That means a total savings of $210 per month. Even if you assume that your ICF home will cost you $10,000 more (And it could possibly cost less! ), and even with a 7.25% interest rate, that only means an additional cost of $60 per month for choosing ICF. That’s still an extra $60 a month in your pocket from the point your home is built! 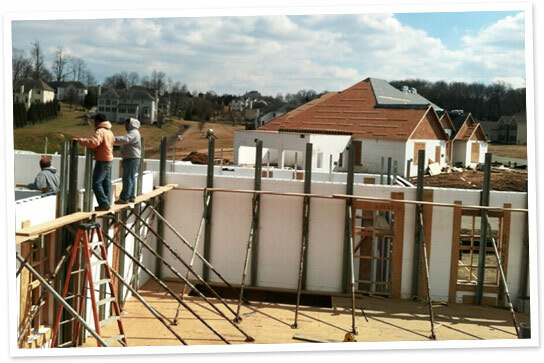 ICF homes can withstand winds of up to 250 miles per hour. A full-blown hurricane starts with wind speeds of only 75 mph, and you are protected at speeds of up to 250 mph. 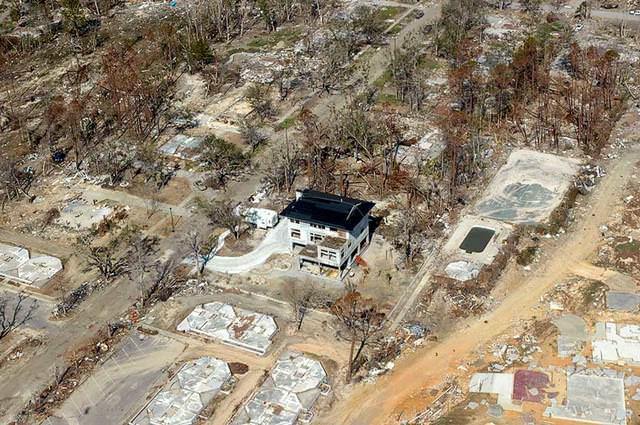 Take a look at this ICF built Hurricane Katrina home which is the ONLY ONE left standing in the whole neighborhood: Katrina ICF Home. Black mold is associated with many different health problems. Even beyond health risks, it’s an expensive and labor-intensive problem to fix. 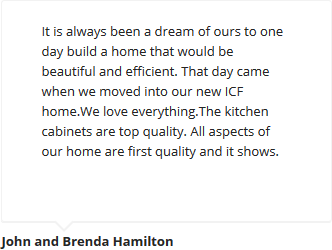 ICF custom homes are not only mold-resistant, but nearly mold proof! The material is not a good home for mold, and unlike some house materials, mold cannot consume it for nourishment. ICF-built houses are extremely fire retardant. Naturally, concrete is not flammable. Multiple studies have been performed on the behavior of ICF in a fire. Those studies found that ICF frames took 4 times longer to show any structural damage than wooden frames in the event of a fire. Sturdy ICF concrete is remarkably sound-proofed. Even with busy streets outside and airplanes overhead, you’ll have a home that remains quiet and peaceful. Studies have found that these homes insulate 4x more noise than lumber-based homes. Your house will always be your oasis. Do you like to be protected? Then you’ll love our comprehensive warranty packages available in both Maryland and Delaware. We support every home we build from the moment the first dirt is shoveled until the decades after the home is completed. Ask us about our warranty packages to learn more. We stand behind our materials and craftsmanship. Every part of every home we build is constructed using the finest materials, and to the toughest standards we can set. We even perform multi-point inspections at each stage of construction to make sure we haven’t let anything slide. The house you end up with when we’re done is the highest-possible quality home we can build. Stephen and the rest of the family at Excel Builders have been building homes and commercial buildings for more than 25 years. He was one of the very first builders to bring Insulated Concrete Forms (ICFs) to the area in 2004, and with the help of the team, he continues building some of the highest-quality homes in the country. We are truly client-focused builders. Your custom home is yours to design however you wish, and we’ll match every request you make to the letter. 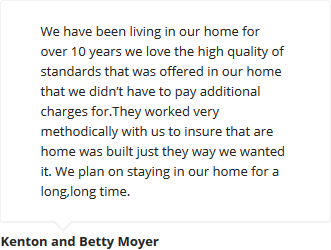 Our mission is to make sure that you are left with the home that you’ve always dreamed of. It makes us proud to get you there.